We are all familiar with trademarks from “Google” to ‘McDonald’s”. But who are the UK’s most active trademarkers? And, how is the profile of trademarking changing in the UK? Some data recently published by the Intellectual Property Office (IPO) on domestic trademark applications in the UK suggests some of the answers. Before looking at the data it’s worth noting that evidence from research studies shows that trademarks are one of the commonest forms of IP protection being used by 23 per cent of Spanish firms and 22 per cent of SMEs. And, because of their relatively low registration cost, trademarks may be particularly important for smaller firms. The same Spanish study suggests that trademarks are positively linked to firm performance for small firms but not for medium and large firms. This effect also proves strongest outside more technology-intensive sectors. Similar positive relationships between trademarks and the market value of companies have also been noted elsewhere. And, for the world’s top R&D investors another recent study suggests that trademarks can help to enhance the economic returns to R&D investments in terms of sales growth. 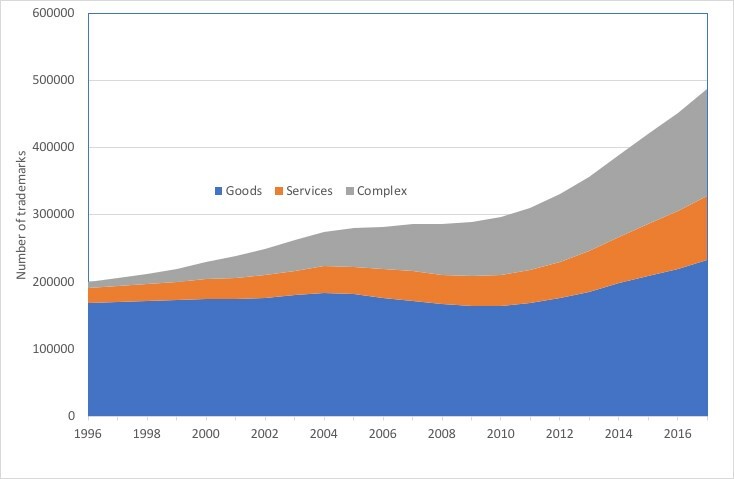 The IPO data suggests that in 2017 there were around 488,000 individual UK trademarks which were live in the UK relating to either goods, services or a ‘complex’ combination of both. Figure 1 gives the time trend over the last twenty years suggesting the increasing number of live trademarks. The data perhaps makes more sense if we group trademarks by the companies that own them. 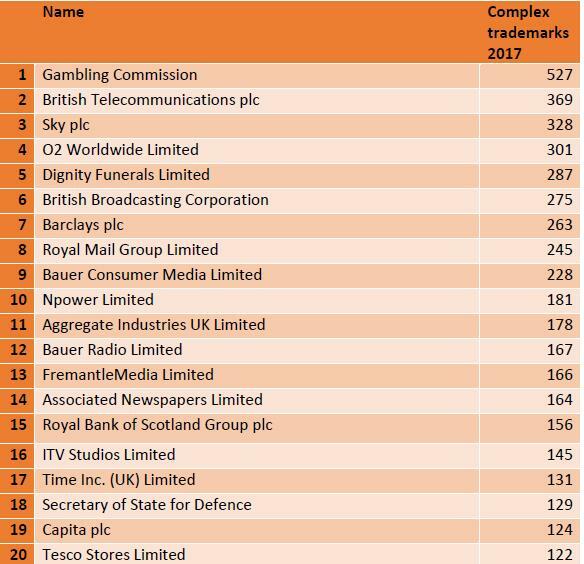 In terms of trademarks relating to goods only Figure 2 gives the UK’s top 20 trademark owners in 2017. 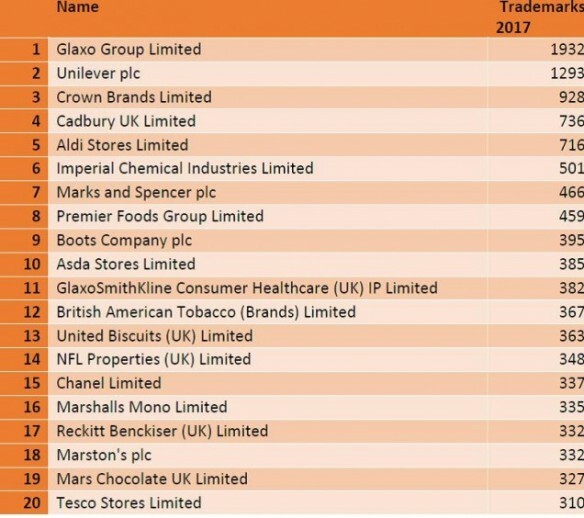 Top of the product trademark league table are Glaxo Group and Unilever with Crown Brands in third place having trademarks for a number of names of paint colours. 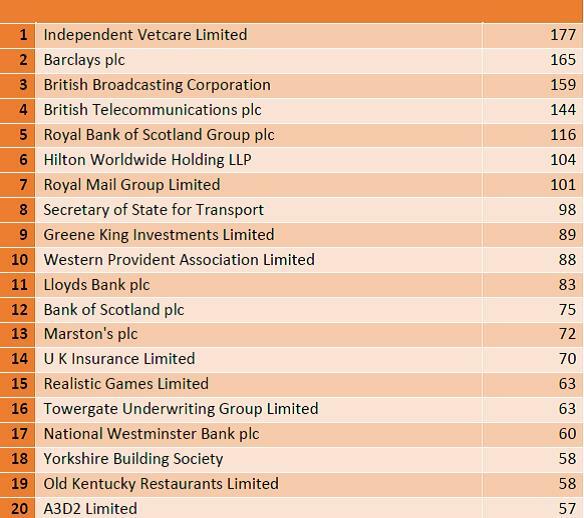 The list of top trademarkers for services brings a few more surprises with the list topped by Independent Vetcare Ltd who hold trademarks for the names of a large number of independent vets clinics (Figure 3). The BBC is also active in the trademarks arena protecting service titles such as “BBC Knowledge” and programme titles such as “Grandstand” and “Desert Island Discs”. More complex trademarks can cover a range of activities related to both products and services and here there are further surprises with the Gambling Commission holding a large number of trademarks including “Euro Millions” and the somewhat unlikely “It could be Ewe”. Other entries in this table are more expected with the table dominated by media and communications businesses. Further research is needed to determine the value of trademarks of different sorts to UK businesses, and how trademarks can help firms to maximise the returns to product and service development. To help we are making available our patent timeseries database for all UK firms which has been derived from a cleaned version of the February 2018 IPO data. Please note that the views expressed in this blog belong to the individual blogger and do not represent the official view of the Enterprise Research Centre, its Funders or Advisory Group.